Perhaps the St. Charles Streetcar, that runs through the Garden District, may be more famous. But, I really like the contrast of the red Canal Streetcar against the blue hour sky. I stayed at a hotel on Canal Street and the frequent streetcar sightings beckoned me to make a photograph. I waited for peak blue hour. 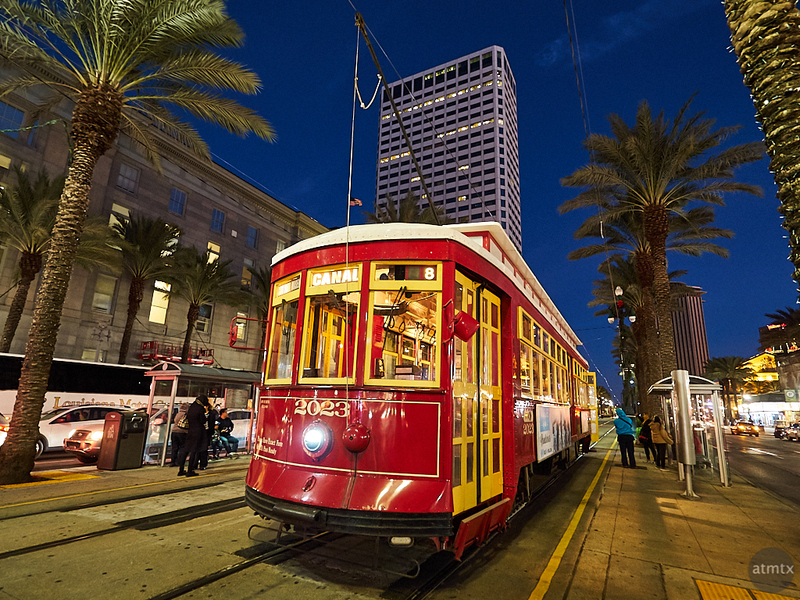 There are multiple streetcar lines in New Orleans, many appear to be of a classic vintage. They add a good deal a charm to a city already brimming with history and visual interest. Unfortunately, I was only in New Orleans for several days. Too short really to experience it all and capture the multitude of images that I would like. But I made the best of my short stay, bringing my usual pair of Olympus cameras and shooting about 2,000 photos. For this image, I used the Olympus PEN-F with the Olympus 9-18mm wide-angle lens. I hope someday you’ll do a write-up on your workflow for dealing with the quantities of images you bring back from your photo excursions. I’m not anywhere near you on that but I’m often overwhelmed at managing it all. Love to hear how you handle it. I don’t think I do anything special with my workflow. You’re probably more organized than I am. I just stuff all my photos in a catalog and create a new catalog every year.